This product is proudly hand made in the USA. It is a brand new 44 heavy duty COMMERCIAL series snow tube. Total weight is 13 pounds. This model has 12 handles. 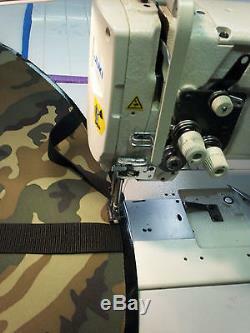 The top cover fabric is 18 ounce PVC backed vinyl. 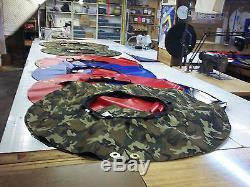 The black fabric bottom is 40 ounce Urethane GLOSS coated vinyl. 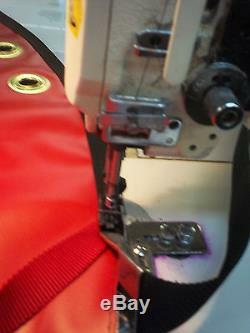 We ONLY use gloss coated fabrics for snow tube bottoms, as the gloss makes them slide faster, and prevents sticking. 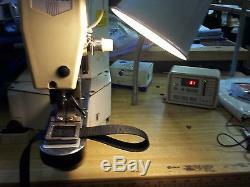 I have included photos of our sewing factory, showing how your snow tube is made. 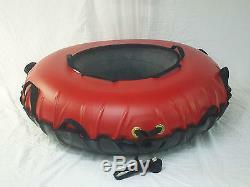 This Snow Tube comes with a heavy duty Rubber inner tube (6 lbs) that is inflated like a car tire. The total weight of this snow tube package is 13 pounds. Our commercial snow tubes are in use daily at Echo Valley Ski Area in Chelan, WA. Mt Hood Ski Bowl in Oregon. Leavenworth Ski Area in Leavenworth, WA, Mt Bachelor Ski Area in Bend, OR , Snoqualmie Pass Ski area, and have been in service at some for over 5 years. Our commercial snow tubes come with 2 heavy duty NYLON belly handles to allow for lay down snow tubing. Ne removable, replaceable Hand Tow leash through brass grommets, 4 handles in the inner bind for smaller riders and (6)1.5 heavy poly webbing handles all the way around the snow tube. These are the real thing. Yes, we really do make them here. NOT designed for towing behind ATV, motor vehicles or snowmobiles. These are made in Washington State. 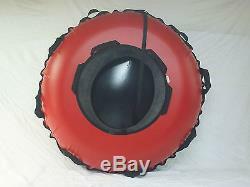 The item "NEW 44Heavy Duty Commercial snow tube 12 Handles Made in USA RED" is in sale since Monday, November 4, 2013. 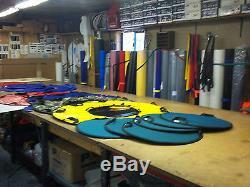 This item is in the category "Sporting Goods\Winter Sports\Sleds & Snow Tubes". 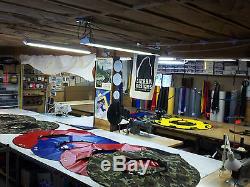 The seller is "snowgear-sales" and is located in Skykomish, Washington. This item can be shipped to United States, Canada, United Kingdom, Denmark, Romania, Slovakia, Bulgaria, Czech republic, Finland, Hungary, Latvia, Lithuania, Malta, Estonia, Australia, Greece, Portugal, Cyprus, Slovenia, Japan, China, Sweden, South Korea, Indonesia, Taiwan, South africa, Thailand, Belgium, France, Hong Kong, Ireland, Netherlands, Poland, Spain, Italy, Germany, Austria, Israel, Mexico, New Zealand, Philippines, Singapore, Switzerland, Norway, Saudi arabia, Ukraine, United arab emirates, Qatar, Kuwait, Bahrain, Croatia, Malaysia, Brazil, Chile, Colombia, Costa rica, Dominican republic, Panama, Trinidad and tobago, Guatemala, El salvador, Honduras, Jamaica.